Note: I may have got some of the details wrong about speeches – I was transcribing on the day so if you think something sounds weird, it’ll be me not them! These are my recollections, any mistakes mine! Well, I’m back from my trip up to Edinburgh. I went to attend the Premier Mind and Soul Conference, also known as Headroom. 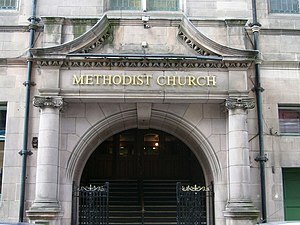 The event was on Saturday 3rd of November at Central Hall, Tollcross, which is the home of Morningside Baptist Church, now known simply as Central: Jesus at the Heart. I was surprised to find so many people there – I am aware that mental health is an important issue for churches/Christians but I didn’t realise so many people cared that they would actually travel to Edinburgh for a conference about it! There were several hundred people there (they did give the exact figure on the day but I forgot to write it down!) Most of the people I spoke to were from various “interested parties” – charity workers, doctors, nurses and counsellors among them, although I did spot some of us service users there. We started the day off with a short worship session led by the Senior Pastor at Central, Karl Martin. This consisted of some enthusiastic singing of worship songs the words to which were projected on the wall, and some prayer. The hall itself was impressive, a large church with gallery and I spotted a pipe organ but this was not used. Everything was quite high-tech, with a big projector and everyone mic’ed up, and someone controlling the sound at the back so it all ran smoothly. The first speaker was Professor John Swinton from the University of Aberdeen who was fascinating and a big draw for me to come to the conference. His background could not be more suitable for talking about faith and mental health: in addition to being a rather good theologian, he has also been a mental health nurse, then a learning disabilities nurse, a hospital chaplain and a community mental health chaplain! He also writes and researches about disability in the church (not just mental disability) which is another interest of mine, although at this conference he was obviously talking about mental illness. His speech was on “One Head, Two ‘Cures. '” He made the point that “cure” should be in inverted commas because a cure is not always possible, or even best for a person. He talked about the Biblical view of health – saying that the Bible has no word for health as we know it (i.e. health as the absence of illness, a medical model) but the nearest it has is shalom – righteousness, a right relationship with God rather than being a physical state. To be healthy is not to have the absence of illness but to be right with God. He said that this may give us a different interpretation of mental illness than that of psychiatry. Swinton said that with mental illness we encounter the world in distressing – but also spiritual means. He suggested that diagnosis has a biological, social and also spiritual implication. He referenced Walter Brueggemann and talked about the psalms being meant to move people to a reorientation in distress, moving from the disorientation of the emotions through to a reaffirmation of Yahweh’s being, and thus being reorientated in faith. He said that the dissonance of mental illness disorientates us, our old stories no longer fit and we need to reinterpret our lives. Reorientation enables us to see the world differently and ask new questions. 1. Our lives are ruled by time. He mentioned the Sacrament of the Present Moment and said that we need to use time faithfully. Augustine said that God is outside time and time comes into existence at Creation, that time needs to be redeemed. He said that the gift of the church to mental health services is time, that we can take the time for small things. 2. Friends are usually similar to one another but that Jesus made friends with “different people” – we can see psychotic people differently through the lens of friendship. He mentioned that there is a give and take in relationships. Through Jesus the marginalised become the central people. Jesus was often the host, or the guest of people on the margins and we need to be guests too, not just hosts. We need to be free to be ourselves within friendship, not unity or amalgamating with another but free to differ as well. Returning to the theme of diagnosis, he said that it is not the only way of looking at people. There are possibilities of health within illness – we do not have to be completely cured to be healthy. I found his talk fascinating, and it brought concepts I had not heard of to me, and I think his theological works will make their way onto my reading list. I would like to have heard more really, but I have to admit that I found it hard to concentrate on what he was saying for the half hour he spoke (this is not a reflection on him – my concentration is not fantastic these days and I was tired). After he spoke we had some comedy from Ian Smith who performed The CLOTS Guide (available to listen on Mind and Soul) and was really rather good. He certainly made me laugh! We then broke for coffee and, afterwards, split into three groups for different seminars. I went to “Faith and the NHS” by Dr Rob Waller who is a Consultant Psychiatrist and who is on the leadership of the Mind and Soul website. I won’t go into as much detail on his talk as I did on Professor Swinton’s but he spoke about the difference between spiritual care and religious care, and said that it is everyone’s responsibility in a healthcare setting to provide spiritual care, but that religious care (which he said was the specifics such as masses, communion, things that must be provided by a proper minister) was just for a few. He broadened the description of spiritual to include not just religious elements per se but things like seeing the whole person not just their illness, that it is the need for love, meaning, purpose, trust, it is a source of hope, the expression of personal beliefs and creativity. He said that spiritual care should mean that we have a one-to-one relationship with a patient that is person-centred and has no assumption of anyone’s personal convictions (i.e. they may be religious or non-religious.) He also mentioned that there can be informed absence, that there are times when we should back away and let the person make their own spiritual growth. An interesting factoid that came from this talk was that, of the 4,000 psychiatrists in the Royal College, 2,000 of them are in the spirituality group. Just before lunch we had a talk about Living Life to the Full With God. This is an adapted CBT course which can be run in small groups for people with mild depression, anxiety etc. It is also free, and available on the Mind and Soul website (you need to register with Mind and Soul, but this is free too.) I haven’t checked out the resource yet but it sounds absolutely excellent, and perfect for small group work in a church group. We then had lunch, and afterwards we had a small change to the proceedings. The keynote speaker for the afternoon, Kate Middleton (not that one!) wasn’t able to come, so we moved onto the afternoon seminars. I wanted to go to 21st Century Sanity, but unfortunately that speaker, Andrea Wigglesworth wasn’t able to come either so I instead listened to a talk on addictions. This was interesting, although not something I would normally be interested in. The only problem there was that the speaker was a bit fast, and my concentration levels were swiftly disappearing! I made it through the session but skipped out before the replacement keynote speech and the Q&A that were scheduled later. To be honest I started yawning uncontrollably and felt absolutely shattered, so I had to go, else I risked falling over and in any case would not have taken in anything further that day. I met some interesting people, and picked up some very interesting reading material! There were stands with leaflets, booklets, magazines and books. Many of these were free – I am particularly interested in a (free) magazine-type booklet about chaplaincy, and some books I bought. I found some small CBT ones which I thought might be interesting, and one called “Depressed or Possessed? Christians Recognising and Responding to Mental Illness” which I am assured is not as dodgy as it sounds! I enjoyed the day, although I did feel it was more geared to professionals than service users, but it was heartening to see so many interested, and I listened to some great stuff. I also met Rachael Costa (@rachiecosta) who runs Think Twice which produces information about mental health for churches. All in all, a good day and I enjoyed myself! I wish there were more things I could go to like it, because I found hearing other people talking about mental health and faith was inspiring. Thanks, given me a real insight into your day, particularly interested in the speech you gave in depth insight into. One thing I forgot to write down is that, if I made any mistakes, they are my mistakes in transcribing! Actually, I’ll do that now. Thanks for commenting – John Swinton’s speech was really interesting, good to hear some theory/theology about mental health, as I’ve not really read that much! Thanks Emma. Great summary and glad u were able to come. Rob. P 450 were there! Thanks Rob! Enjoyed your talk very much!